Shoppers looking for innovative and affordable products for corporate giveaways of Christmas gift ideas flock to various bazaars in the Philippines. While most of these open beginning September, don't be surprised if you find some as early as July. The great thing about shopping in most of these bazaars is that you'll find a number of clothes, toys, knick-knacks, shirts, blouses, and other wonderful gift items at affordable prices. So don't get caught in the mad Christmas rush. Shop early, and shop wisely! NEWS: 3,000 sqm in the Greenhills area available for bazaar organizers this December 2006. For details please contact Mon Dayrit at +632-824-7810 (res), +63917-8914567 (mobile), or +632-6876369. 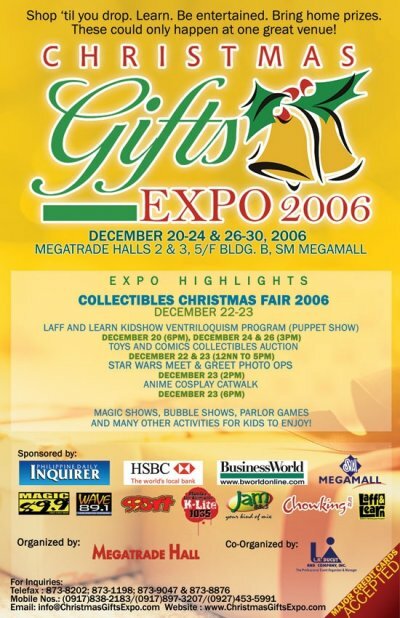 UPDATE: Philippine Christmas Bazaars 2007. The longest running bazaar since the 50s. The High School Class 1982 of the St. Scholastica's College Manila is proud to present the "Serenade at the Bazaar" – a whole day 'til midnight International Pre- Christmas Bazaar spiced up with an evening show featuring the fast rising bossa nova artist, Sitti! The event will be held on November 17, 2006,Friday, from 8am until 12 midnight at the Sanctuario de San Antonio, McKinley Road, Forbes Park. The event is expected to draw not only the St. Scholastica's College community but as well as crowds who are raring to cash in their well-deserved bonuses for an early Christmas shopping spree. Proceeds from the event will benefit the St. Scholastica's Center for Spirituality. Hello everyone its coming again.... Bazaar time! and the best bazaar for the last two years is back for its third year. Tiangge sa Valle Verde one is holding its christmas bazaars again on the dates of Nov 18 - 19 and Dec 16 - 17, thats both on a Saturday and Sunday. Just like the last two yaers we will be presenting the spirit of christmas wrapped up with great products by up and coming entrepreneurs ready to show thier stuff off. We will have our annual raffle for customers and concessionaires and shows to entertain you and make your experience at oour exhibit one of a kind. Give books for Christmas. Come to the Christmas Bazaar of the Zonta Club of Makati & Environs--Sunday, November 19, 2006, 8 a.m. to 8 p.m. Parish Center, Santuario de San Antonio, Forbes Park. Shop till you drop for quality products not found in shops: export fashion accessories of Bettina Osmena, Victoria Marin, and Ching Feliciano; leather goods by Adela Wassmer, Talimaya bags; home accessories and linens by Eva Abesamis; imported shawls and bric-a-brac from Bel O. Cunanan; Cambodian and Vietnamese treasures; silver jewelry by Jacqui D. Boncan; Burmese gems, etc. Have a snack or stay for lunch at the tented grounds with gourmet food from Chef Ed, La Tasca, and La Cuisine Francaise. The Zonta Club of Makati & Environs Foundation, Inc. hopes to raise funds for its grassroots development program for disadvantaged women, training them to be micro-entrepreneurs and providing them with start-up capital; and for its wards--250 sexually abused girls aged 5 to 18 at Marillac Hills, Muntinlupa. The club also has a preschool with 110 indigent children at its Community Center in Fort Bonifacio, Taguig, with free medical services for the community. Zonta International is a worldwide organization with presence in 68 countries, working to advance the status of women through service and advocacy. Four publishers participating--UP Press, Anvil, Tahanan Books, and Adarna Press--at the annual Christmas Bazaar of the Zonta Club of Makati & Environs. 10% percent of book sales will go to the Likhaan Creative Writing Foundation which provides scholarships to needy but deserving Creative Writing students of UP. All our past scholars have won awards for their writing. The Enterprise Center is conveniently located at the busy heart of Makati City and is the entry point to the covered walkway from the Makati business district area to Landmark and Greenbelt. The bazaar area is located right beside the walkway in the lobby of Enterprise Center. The Enterprise Center bazaar has been widely looked forward to and is continuously attracting more clients. Christ the King Church Parking Grounds, Greenmeadows Ave. This is for the benefit of kids with cancer at PGH and in cooperation of MAke-A-Wish foundation and Philippine dodgeball association. Shaw Blvd. cor. Wack Wack Rd. 150 Vendors offering an exciting array of products in a big, secure, comfortable and air-conditioned venue. Discover new things / products in the Market. COME & ENJOY A DIFFERENT BAZAAR EXPERIENCE! The bazaar area is located at the covered activity center of a newly opened hotel (soft opening this nov. 25) in San Pablo City situated beside Villa Escudero. Part of its offering to the residents of San Pablo and nearby towns is the holding of this bazaar to be able to raise funds for the benefit of indigent residents of barangay san antonio. Paskong Pilipno 2006 will be launch in a more dynamic, vibrant, entertainment that centers on the Filipino family celebration. The event will showcase Philippine made products like handicrafts, such as crafts and tribal arts, hand woven products, native furnicrafts, woodcarvings, paintings, shell products, Philippine delicacies and native accessories, Philippine made products like novelties, home decors, Christmas decors, Christmas give away, and souvenirs, Ladies and Men's wear, sandals, slippers, bags, toys, fashion accessories, Corporate to include but not limited to banks/credit card facilities, franchise, real estate, telecommunications, tourism facilities, vehicles and others. Powered by intensified quad media advertising & publicity campaign to create awareness and generate huge crowds of shoppers. There will also be a lot of well-known personalities from the showbiz industry, and we will be getting a lot of mileage from top broadsheets and TV news programs and shows. We shall be featuring various entertainment programs and activities to add up to the celebration like live band featuring local artists, fashion show, cultural show, and raffles among others. The event also offers a lot of benefits to participating companies who wants to promote and sell their products and services. Your company will be assured of high profile exposure. It's your chance to promote and capture more customers. This is a time tested strategy. Anyone who would like to go that extra mile should join us. Grab this opportunity! If you want to promote and expose your products or services and boost your sales, join the Paskong Pilipino 2006 Shopping Expo. Make A Wish Foundation Philippines "Share the Power of a Wish"
The biggest bazaar in the South with more than 450 concessionaires. LOTUS 1 ASIA TOURS & EVENTS MANAGEMENT in partner with Pamilyang OFW-SME Network Foundation, Inc. will be holding the PAMASKONG HANDOG SA PAMILYANG OFWs at SMEs 2006 (The 1st International Exposition of Christmas Giveaways for the OFW and SME Families) showcasing Banks, Financing & Remittance Services Expo 2006; Clothing & Shelter Exposition 2006; Food & Beverage Trade Show 2006; Job & Livelihood Options 2006; and Transport & Travel Fair 2006 on December 2-3, 2006 at the Philippine Trade Training Center in Pasay City. With expo’s theme, "Trabaho, Kabuhayan at Negosyo Alay sa Pamilyang OFWS! ", the main objective of the event is to make the country’s more than 9 million OFWs and their families, the 475,000 plus and SME families as well as those involved in the overseas employment and small and medium enterprise industries aware of the various job, livelihood, investment and business opportunities being offered by the private, government and non-government organization sectors. We invite you to be a part of this BIG event either as a PRESENTOR, SPONSOR or EXHIBITOR to further promote and market your company’s products and services on this must-see event for the OFW and SME families as well as the other key players of the two industries. For queries, please contact Mildreth at Mobile No. 0927 604 6876. The Biggest Annual Pre-Christmas Bazaar in Pasig on its 3rd year! You are invited to join the annual Maligayang Pasko ’06! Bazaar at the Valle Verde 5 Covered Courts on December 9 & 10, 2006. Dubbed as the biggest bazaar in Pasig, the event will feature over 120 stalls with a wide variety of products for sale. This event is the ideal place to expose your products to the market, to promote your services, to boost your sales, to obtain new clients and to take advantage of the shopping hype present during the Christmas season. The venue is located conveniently adjacent the newly opened SM Hypermart in Frontera Verde. The event will run from 9 AM to 9 PM, thereby optimizing your selling time. As part of Maligayang Pasko! Bazaars’ tradition, we shall be featuring various entertainment programs and other activities to add up to the celebration. We will be having hourly raffle draws all throughout the day, and entertainment programs will be held for the whole family, among others. Grab this opportunity and don’t miss out on the biggest pre-Christmas celebration in Pasig City! If you want to promote and expose your products or services and boost your sales, join the Maligayang Pasko 06! Bazaar, the biggest bazaar in Pasig and experience a truly Merry Christmas! Limited Slots Only...Book your Space now! BIG TENT Holy Spirit Drive, Isadora Hills, Don Antonio Heights Q.C. Due to the success of the said event, concessionaires clamor for additional bazaar dates. So here it is, Please mark your calendars. 70 Booths will be selling rtw the likes of MNG, 7 jeans, nike dri fit and rtw from thailand and local brands, footwear, accessories, bags, christmas decors, childrens's books, toys, etc. Enjoy shopping in an airconditioned and secured venue. Customers will have a great bargain coz surely concessionaires will make a price markdown for this is the last big sale for the year 2006. Great Finds and good food will surely bring out the shopaholic in you. Free entrance and free face painting. Organized by ORDEP Trade and Exhibits for inquiries please call 411-8126/ 09174404690. See you there. Promote your brands, do direct selling, test the local market for your export products or simply convert your heavy inventories into cash at the Expo! Imagine close to 230 booths consisting of a real estate section, a bazaar, a Filipiniana section of more than 30 booths, popular signatures and brands, food and wine, health, beauty and wellness products and services, A to Z Holiday gift ideas and concepts among others- all in one place. This powerful merchandise and products mix as well as our intensive advertising and promotions campaign guarantee the success of your participation at the CHRISTMAS GIFTS EXPO. * Corporate (banks/credit cards; real estate; tourism; telecomm, etc. It's that time of the year again to fill the holiday stocking and play "Santa". But with weeks to go before Christmas, it's no surprise that many are on a mad dash to the stores, rummaging through shelves for gifts to wrap. Thankfully, at the Christmas Gifts Expo 2006 which will run from Dec. 20 to 30 (except Dec. 25) at the Megatrade Halls 2 and 3 of SM Megamall, there's no need to rush the holiday shopping. The long-running event is the perfect place to shop for one-of-a-kind gifts at any price point. With a good range of merchandise mix that come from all over the country, there will certainly be a "little something" to give for someone. Wrap a fashionista friend some accessories from Cebu and Zamboanga courtesy of companies like Trendexpert, RKOC Shells Export and Almar Shell Industries. Delight mom with interesting home decors like acacia kitchen items by Global Export Products, wood chimes by Seven Trees, Pinatubo-ash frames by Excel Frames and Decors, charcoal stoves by G.O. Engineering, bamboo creations by F. Barcenas Bamboocrafts as well as hard-wood furniture from Cagayan Valley, Baguio, Laguna and Palawan. For the handicraft-lover, pick from any of the crafts by Analobel Enterprises or natural and recycled paper creations by Paper and Arts. Aside from toiletries and a variety of scent collections, there are hand-embroidered barongs and export overrun apparels to choose from. Food fanatics are likely to discover some of Pinoy-made favorites like puto bumbong, suman, kasuy, pili nuts, pinangat, sisig and other delicacies from Quezon. Of course, not to be missed out are the imported cold cuts, Hungarian sausages and ham, the latter being a Noche Buena staple. For health-conscious shoppers, drop by at Health Hub to check out revolutionary wellness products and state of the art nutritional microscopy for health awareness and preservation. Mostly, don't miss out the two-day Collectible Christmas Fair 2006 on Dec. 22 and Dec. 23 where an interesting range of toys, bargains and collectibles are up for the taking. Certainly, the fair is a kid and young-at-heart's paradise as anime, comics, toys, cards, games, dolls, action figures, collectible cars and memorabilia swamp the display shelves. A sub-highlight to the fair is the Toys and Comics Collectibles Action held from 12 noon to 5 p.m. within its two-day run. Then, a fitting end to the grand fair is an Anime Cosplay at 6 p.m. on Dec. 23. Cosplay, the art of "costume play", is where participants dress up in colorful wings, wigs and costumes in cutting-edge Anime fashion; thus, shoppers are not only treated to interesting buys but also to a fun, holiday shopping experience. Plus, premier Filipino ventriloquist Ony Carcamo, is set to bring in his wacky puppet friends to the Christmas Gifts Expo 2006 as well, delighting kids who need a little entertainment while mom is busy filling up the shopping bag. Catch this awardee for the National Commission for Culture and Arts on Dec. 20 at 6 p.m. and Dec. 24 and 26 at 3p.m. There will also be magic and bubble shows, parlor games as well as a Meet and Greet Photo Opportunity with Star Wars characters at 2 p.m. on Dec. 23.